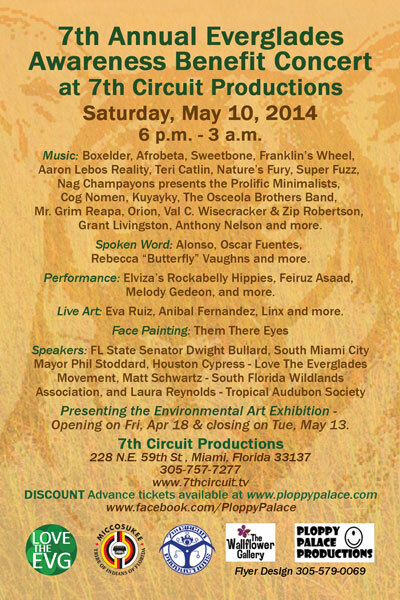 On Saturday, May 10, 2014 Ploppy Palace Productions and The Miccosukee Tribe will be hosting a concert to raise awareness and funds for Everglades protection and public education. As part of this three stage extravaganza, some of South Florida’s top bands, spoken word artists and community activists will join together to raise awareness for this vital natural resource. There will be musical performances by Boxelder, Afrobeta, Sweetbone, Franklin’s Wheel, Aaron Lebos Reality, Nature’s Fury, Teri Catlin, Super Fuzz, Cog Noman, Nag Champayons present the Prolific Minimalists, Kuyayky, The Osceola Brothers Band, Mr. Grim Reapa, Orion, Val C. Wisecracker, Grant Livingston, Anthony Nelson, Silver Nightingale & more. Spoken word by Alonso, Oscar Fuentes, Rebecca “Butterfly” Vaughns & more. Live art by Eva Ruiz, Anibal Fernandez, Linx, Jake Cordero and more. Community speakers include South Miami City Mayor Phil Stoddard, Houston Cypress from Love The Everglades Movement & other concerned citizens.. In addition there will be an Environmental Art Exhibition featuring a selection of distinctive artists including Mark Henson, Kiro Fox Ace, Eva Ruiz, Lloyd Goradesky, Brian F. Call, Lauranda Hook, Peter Barreda, Margrit-Rose People, Aeric Moskowitz, Alissa Christine, Flex Maslan, Brian Pruitt, Rei Ramirez, Abdiel Acosta, Jorge Muriel, Wesley Geometry, Jake Cordero, Luis Alejandro Diaz, Jean Sarmiento, Mike Jones, Anibal Fernandez, Chia Ortegon, Stephanie McMillian, Aiyesha Ghani, Claudia Costa and Anastasia Sultzer and more. One of the reasons why this is an Environmental Art Exhibition, rather than an Everglades Art Exhibition is because we want to reach out to more people and see how they connect with the environment, ecology and nature in general. Many people do not get to experience the Everglades and their relationship to the region is limited, yet everyone should have some sort of environmental awareness and some understanding of what it means to have clean air, clean water and an area that is pollution free. We want to reach out to more people and share environmental consciousness – and that happens many ways. 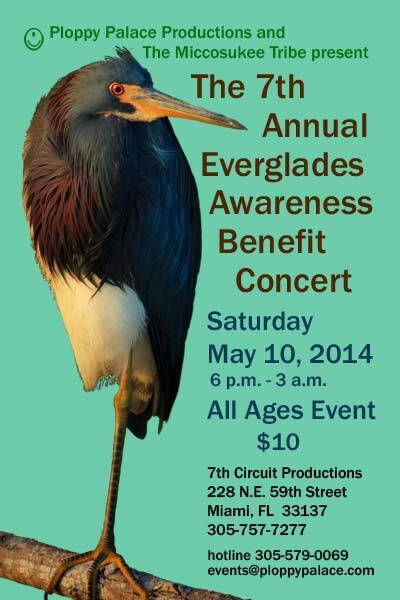 The Everglades Awareness Benefit Concert Series is a platform for individuals and organizations to engage the community about environmental issues and find solutions to help protect the Everglades ecosystem and our water supply. For this family friendly event, we are reaching out to other businesses, governmental agencies, various organizations and the community to become more aware and more active. This event features a diverse mix of entertainment, environmental artwork, community speakers, information booths and local vendors. We utilize art activism to highlight the environmental content within the various performances and presentations – this format opens the message and expands the chorus of voices working for positive changes. There will be information booths from Love The Everglades Movement, Tropical Audubon Society, Legalizepot.us (voter registration) & other organizations. In addition there will be vendors and small businesses promoting & selling their merchandise, including The Wallflower Gallery, Moksha Boutique, Loutus in Hand.